Unlike summer salads, Christmas salads are a gussied-up, imaginative affair. Check out the great tips on how to make Christmas salads below to see how they can jazz up your Christmas dinner menu. Then check out some of the festive salad recipes we’ve dreamed up. They range from leafy green side salads to Greek salad recipes. Sweet and savory salads are a great way to dress up the dinner table. Gone are the days of lettuce-only salads. Adding fruits and nuts to your mixed greens is a great way to pump up the flavor and add some holiday color. 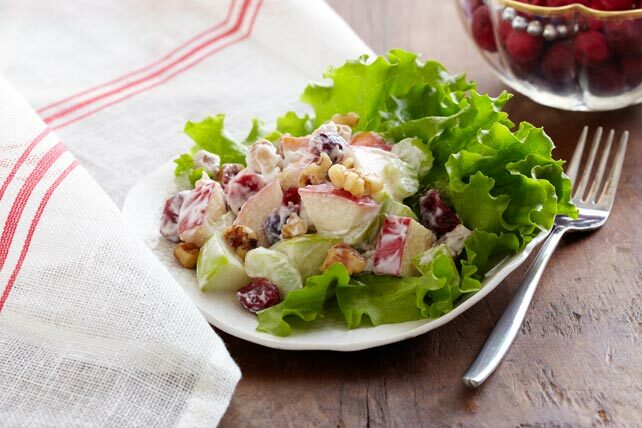 Why not try our Sweet Cranberry & Pear Tossed Salad or Sunshine Citrus Salad? Toasting nuts adds crunch and intensifies their flavor. To toast nuts in the oven and try out this Christmas salad idea, spread nuts in single layer in shallow pan. Bake at 350°F for 10 to 15 min. or until golden brown, stirring occasionally. Pomegranates make a dramatic centerpiece for the holiday table, thanks to their beautiful shape and color. Simply fill a metallic or clear bowl with the whole fruit and incorporate fresh pine boughs for an elegant red-and-green-themed centerpiece. Add pomegranate seeds to a salad. Here are a few of our delicious salads that feature pomegranates for you to consider: Quinoa-Spinach Salad, Pomegranate Pear Salad and Citrus Ambrosia Salad. Use pomegranate juice or seeds in a JELL-O salad. Check out our page on JELL-O salad recipes to get the ideas flowing! Salads are best served chilled. Consider chilling your salad plates and forks in the refrigerator before serving the salad course. To keep salad greens from getting soggy, combine all ingredients except dressing and toss just before serving. Also, keep in mind that salads do not necessarily have to have “greens” to be considered a salad. Consider this fruit salad recipe for a change of pace. Christmas salads can come in so many different variations! Don’t forget to check out some of our holiday collections like our holiday appetizers and the holiday recipes and tips center. Make this holiday the season the best it can be with My Food and Family.